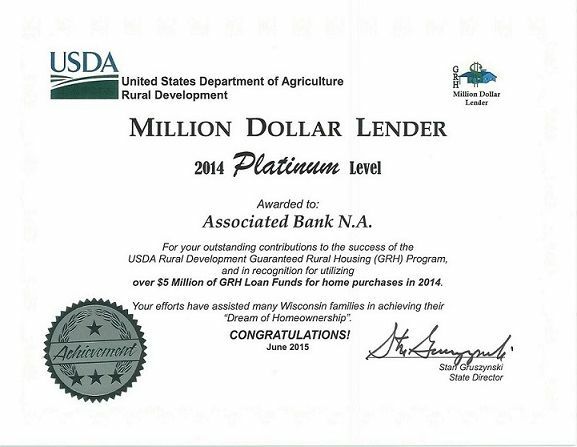 Green Bay, WI – August 11, 2015 – The United States Department of Agriculture (USDA) rural development Wisconsin state director, Stan Gruszynski, recently announced Associated Bank as a recipient of the Platinum Million Dollar Lender Award. The Award is presented to lenders who have made a significant contribution to assisting Wisconsin rural residents achieve the dream of homeownership, in partnership with USDA Rural Development and the Guaranteed Rural Housing (GRH) Program. In fiscal year 2014, Associated Bank utilized more than $5 million of GRH program funds by financing home purchases to help moderate income families in Wisconsin. More than 3,200 families across Wisconsin were able to purchase a home last year through the GRH loan program, totaling nearly $415 million. The Million Dollar Lender Award is presented at three levels based on the total of funding utilized Silver, Gold, and Platinum; Silver level utilized more than $1 million, Gold level utilized more than $2 million, and Platinum level utilized more than $5 million during the past year. Associated has been recognized in various award levels each year since the inception of the GRH program in 2003.